Isn't it amazing that ten years since the creation of the Marvel Cinematic Universe we're going to get a 1-2 punch of Black Panther and Avengers: Infinity War? Shouldn't things be quieting down by now? Shouldn't we be getting bored of the superhero movies? But nope, Marvel won't let us and 2018 may be their most exciting year yet. While I'm reluctant to see too much of either of these films before they hit theaters, if the trailers are as good as the new international cut for Black Panther that's okay by me. I don't know if they can ever hope to beat the first Black Panther teaser for just sheer jaw-dropping awesomeness, but this one comes close. For some reason the Japanese trailers are always better! The best thing about it, and everything we've seen from the film so far, is that it doesn't look like a comic book movie at all. It reminds me of Christopher Priest's incredible run on the comic, which didn't resemble your standard superhero monthly at all. It was part politics, part espionage, part history lesson, and yes, a little bit of beat 'em up action too. I see a little bit of all those things in Ryan Coogler's film and that is worth getting pumped over. Here's the synopsis: Marvel Studios’ “Black Panther” follows T’Challa who, after the death of his father, the King of Wakanda, returns home to the isolated, technologically advanced African nation to succeed to the throne and take his rightful place as king. But when a powerful old enemy reappears, T’Challa’s mettle as king—and Black Panther—is tested when he is drawn into a formidable conflict that puts the fate of Wakanda and the entire world at risk. 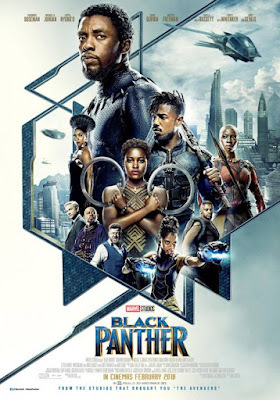 Faced with treachery and danger, the young king must rally his allies and release the full power of Black Panther to defeat his foes and secure the safety of his people and their way of life. Starring Chadwick Boseman, Michael B. Jordan, Lupita Nyong'o, Danai Gurira, Martin Freeman, Daniel Kaluuya, Andy Serkis, and more, Black Panther opens February 16th 2018.